This is funny to the extent it might get a rise out of Ted Cruz supporters. But the Al Jazeera logo is really just one of the more familiar (in the U.S.) examples of the Diwani style of Arabic calligraphy. 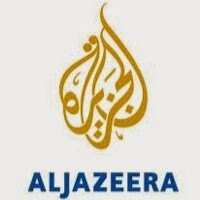 Also the Al Jazeera logo is supposed to resemble a drop of water, not a flame. Maybe that's what Cruz was going for and not a burning American flag.